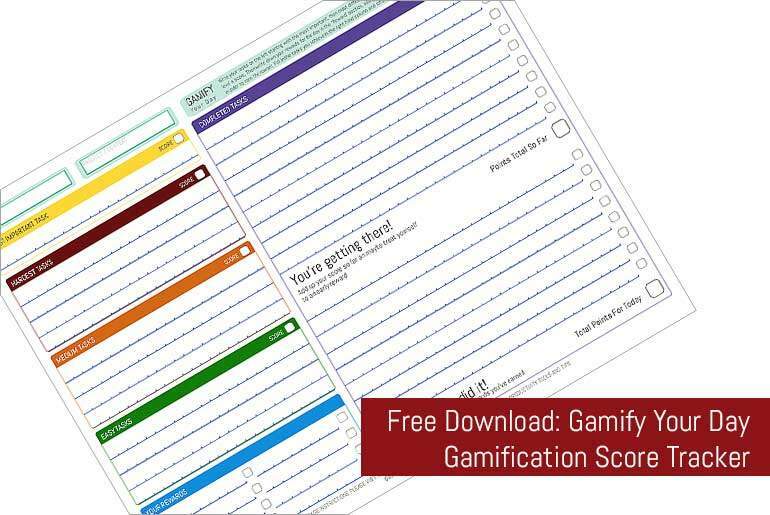 Following on from my post on Monday where I discussed what gamification is and how to track your progress, I thought I’d provide another one of my free planner downloads to help you track your productivity gamification scores. During my research on gamification I found that there a lot of apps out there (and I mean a lot!) that help you track your scores but I couldn’t find a paper based version anywhere. Maybe it’s because the whole idea of gamifying productivity revolves around the idea of a computer game which lends itself – and people who use it as a tool – to purely phone and computer based apps but I still stand by the fact that people like the tactile nature of paper and the satisfaction of writing things down so I developed the “Gamify Your Day Planner”. What is the “Gamify Your Day” Planner? 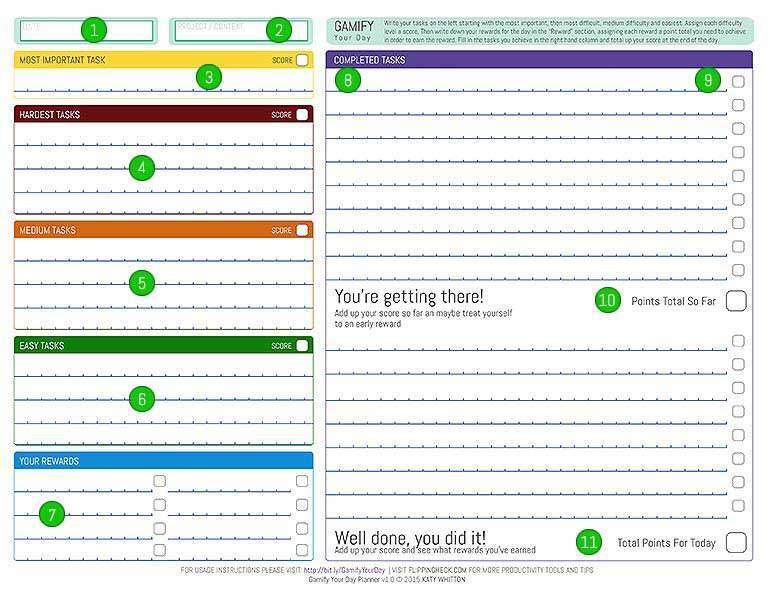 The Gamify Planner allows you to assign scores to a variety of tasks that you need to work on that day. There’s your “Most Important Task” which should have the highest score, your most difficult tasks – tasks that you need to do but don’t really want to – which should have a reasonably high score, your medium difficulty tasks – tasks that you don’t mind doing but could put off – which should have an average score, and your easy tasks – tasks that you love doing or that will only take a couple of minutes – which should have the lowest score. The planner gives you a space to assign a score for each tasks type, but you may feel that you should assign a score to each individual task which is fine, just jot this down next to the task itself. You can then work out your rewards for the day (or overall rewards if you want to tot-up your scores over time) and what score you think you need to achieve in order to be “allowed” them. The bigger the reward, the higher the score that you need to earn it. As you go through the day you note down the task that you have completed and the score associated with it. At the end of the day you can add up your score and work out what reward you want to take – or split the score up to earn multiple smaller rewards. Date: What’s the date that this plan relates to? Most Important Task: What do you really have to get done today? This is the most important task you need to achieve and should have a high score. Hardest Tasks: The tasks that you never feel like doing but need to to. These should have a relatively high score. Medium Tasks: Tasks that you don’t mind doing but probably would put off. These should have a middling score. Easy Tasks: Tasks that are relatively easy to get done but you’d like to keep track of or use them as a motivator to do other tasks. These should have a low score. Rewards: What are your rewards for this day (or project/context)? Assign a score to each reward, the bigger the reward the higher the score you need to achieve it. Half-way point: To bolster your motivation, work out how many points you have score so far. You can then use some of these points for a reward or carry on until the end of the day. You may also want to roll multiple days scores over so that you can get a really big reward. Final Total: This is the total points scored today (minus any you’ve used for mid-point rewards). You can then exchange these points for rewards or keep them for your bigger rewards.